Another excellent work from Tetsuo Hara (Hokuto no Ken), this one is historical fiction about two eccentrics and their quest to... well, do awesome and manly things. This show will put hair on your chest, make your muscles grow and impress women. And if not, you'll still have fun watching it. It's a well-written, stylish show with great art and a strong plot. It's not a 'perfect masterpiece' but it's a great show nonetheless. The OP theme was the best OP theme of 2013. If you like HnK you will like this show, as I did, because it is written in a style similar to HnK. Despite the humorousness of the exaggerated masculinity, the series is riddled with memorable scenes that are slowly and deliberately set up. It's soothingly anti-hyperactive material that you can really sit down to and appreciate at your pace, one episode at a time or several. The same can't be said of many superior animes, which often are either action from start to finish, or which unhappily lurch between this and filler episodes that fail to satisfy. Unfortunately, the budding brotherhood between Kanetsugu and Keiji, which by the midpoint of the show had evolved to become one of its main charms, was all but discarded for the second half. It starts to feel strange that Keiji only really has a presence in the opening and closing credits as well as the sake-drinking scenes of discussion with his friend in the present, given that the show seemed to be about the two of them rather than simply how awesome Kanetsugu is, and the plots around his origins. A host of side-characters file in and out of the episodes, but tend to fail at filling the gap left behind by the eccentric tiger-warrior, not least when they introduce a certain non-human character and give the slightly dull ninja a more central role. I'm not saying any of this to spoil anyone, but rather because I kept expecting Keiji to show up again during the second half, and my viewing experience suffered due to this never happening. Moreover, while I only have praise for the better scenes of this series, there is a lot of time in each episode filled by less impressive or interesting activity, which is a shame because it results in a test of patience that it would appear many potential viewers of this show weren't prepared to put up with. The theme of righteousness and exploration of various individuals' pursuit of it in their own ways is also somewhat dropped and altogether, despite the brilliant denouements in episodes 21 and 25, the second half of Gifu Dodo felt somewhat lacking in departments that it initially charmed me with. Still, it remains a great anime, its flaws being largely made up for by its exaggerated, uplifting, masculine charm. Feel like a change from screaming, teenaged protagonists, moe and hyperactiveness? Kick back and watch Gifu Dodo. First of all, I recomend everyone to read the manga "Hana no Keiji" before getting into this anime. Thing is that, like a reviewer on this anime here said, it is difficult for many to get into this anime. Reading the manga first will allow you to further understand the concept of this anime. With that said, let me express my review on Gifuu Doudou. It was told that Uesugi Kenshin had illegitimate son. The great Shoguns Hideyoshi, Nobunaga and Ieyasu knew of this, but, however, prefer not to spill the news to everyone. 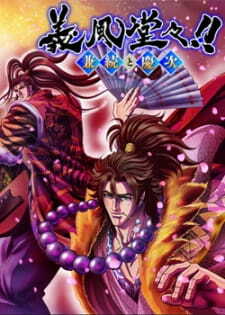 The story centers on two legendary Sengoku warriors, Naoe Kanetsugu and Maeda Keiji, and their battles through the Warring Kingdoms era. Kanetsugu was a great general serving Uesugi Kenshin and Keiji was an unrivaled samurai with amazing swordsmanship skills. So basically both of them attained a high rank among the Sengoku Period and the story is about how they've attained such positions. Now, truth being told, the pace is slow. But really slow. It's more talk than action to be precise. The whole series are basically flashbacks of the two warriors. And there's a lot of talking here and talking there, so for those who prefer more action packed anime, then this might dissapoint you. However, in my case, I didn't mind because, like I said, I've read the prequel manga and I clearly like the setting in here because I knew exactly what happened before. However, yes there should've been less talk and more action. Also, Hana no Keiji had some great comedy moments. This anime tries sometimes but just fails in this aspect. The art is pretty good for its standards. However, the manga Hana no Keiji had better artwork and this anime fails to catch the epicness of its design. It's not as bad as the Fist of The Blue Sky anime adaptation, but I expected more to be honest. I could give it a 5 but I gave it a 6 because the character designs remind me a lot of Fist of The North Star (the manga's art was made by Tetsuo Hara, the sama mangaka of FOTNS). The soundtrack is great. It goes from a relaxing japanese melody and then you hear some epic battle music when the action comes. The opening "Samurai Rock" is really catchy. I have a mixed opinion about this one, but I gave it a 7. Having read Hana no Keiji, I knew who Maeda Keiji was and how epic he was, but this anime did not show enough character development of Kanetsugu. He's just the typical good guy in the flashbacks and nothing changed much in his present self. Keiji too had almost none character development here in this anime, but if you read the prequel manga, you'll understand how epic Maeda Keiji is. The rest of the roster is forgetable, the anime only focuses more on these two warriors. Despite its flaws, this anime is still MANLY! I mean those character designs, masculine attitudes, manly tears, dramatic stories, epic confrontations in the past... It's just MANLY! Like I said, the pace is slow and that's why I give this a 7. Like I said, the pace is slow and that's why I give this a 7. Please read the "Hana No Keiji" manga first before watching this anime, otherwise you'll watch 2 or 3 episodes and you'll become bored out of your minds. But if you like manly anime with tall muscular men, with drama and manly tears, then give it a go. If it weren't for two other particularly strong entries, Gifuu Doudou!! : Kanetsugu to Keiji—the double exclamation marks say it all, really—would probably be a strong contender for the most righteous show of the summer 2013 anime season. Gifuu Doudou!! 's premise is simple: Naoe Kanetsugu and Maeda Keiji, two ridiculously large and powerful "legitimate eccentrics," recount their exploits dispensing their brand of "RIGHTEOUSNESS" all over Sengoku-era Japan. It has the right attitude to make this sort of narrative funny and fun, clearly not taking itself very seriously with things like an over the top opening (entirely composed of recycled footage of course) named "SAMURAI ROCK" with lines like "come on come on come come on SAMURAI BABY" in English and heavily, heavily caricatured depictions of most of its characters. When watched with friends this can all make for a very righteous (and enjoyable) experience. But don't get me wrong, this show is not very righteous (or good) in any traditional sense of the word. Gifuu Doudou!! is plagued by all sorts of problems, from its extremely low budget to its terrible writing and strawman characters. In the world of Gifuu Doudou! !, physical size roughly correlates to righteousness which roughly correlates to power. Most characters are not very big. Okay, so having our protagonists tower over all of the other characters in every scene can be fun if you are the sort of person who can look at that sort of absurdity with an appreciative attitude, but there is one aspect of this show that absolutely lacks righteousness: Gifuu Doudou!! hardly deserves to be called a piece of animation. Perhaps Studio DEEN decided that its money was better spent elsewhere, but this is one of the most plainly underfunded anime of recent years. Foreground characters rarely do much more than flap their mouths, background characters never even move, some episodes are almost entirely recycled footage from previous episodes, and most shots are slow pans across a still image or hilarious slow dramatic zoom-ins on some character's massive face. Most egregious, however, are the "action" scenes. Shirohata Bob, the director, generally does a good job of avoiding action whenever he can by just cutting to shots of bodies on the ground after the enemies have been dispatched (wouldn't want to have to draw too many frames). However, whenever he is forced to show actual combat, the result isn't pretty. Having the top of someone's body literally slide off of his stationary legs while an enormous quantity of horrible looking blood gushes out is bad enough, but even worse is when the director takes a still shot, overlays some diagonal lines, and literally just shakes it for about ten seconds in some sort of pathetic attempt to convey motion. I understand that you're working with approximately one frame every ten seconds, but please, Bob, please don't just shake the camera like that. If you have friends available to take along for the ride and the right kind of appreciation for absurdly over the top samurai-ninja-tiger-monks (Maeda. Keiji.) I wholeheartedly recommend Gifuu Doudou!!. If not, you won't get very much out of this weekly dose of righteousness.